supposed to– and beautifully so. Drainage problems? We have the solutions. Most drainage problems are caused by improper water management, and just running some corrugated black pipe often does not really fix the situation. We can help you to properly manage water flow on your property through expert grading and drainage. We have some very creative and attractive ways to manage the unmanageable. Check out our On-line Portfolio for some of our work. Water up against or running towards your house can really be a problem. It can cause flooding in basements, which is normally not covered by insurance, and can put a homeowner in significant debt. It really pays to make sure that your land is graded properly so that water is running away from your house and not towards it. We can do a custom evaluation of your land to help educate you on what needs to be done with respect to water management on your property. From rain barrels to stone rivers, we can help you to get the water away from your house no matter where you live. 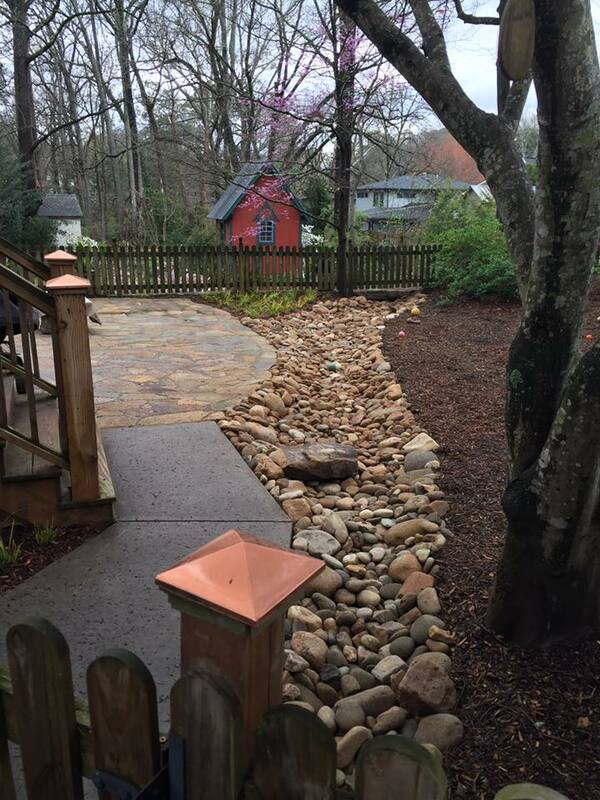 We are drainage specialists in Atlanta, and we serve the entire Metro area including Gwinnett, Lawrenceville, Suwanee, Dacula, Johns Creek, and Alpharetta.